If you are searching for some reliable and trendy footwear this season then look no further! 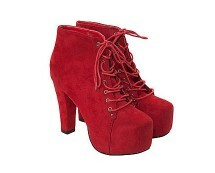 These platform ankle boots are incredibly trendy right now and they are great for day wear as well as evening wear. These boots will help to elongate those legs and will team nicely with absolutely anything, and they are nice and cosy for your feet! This design features a round toe with platform sole and chunky heel which will help to create amazing height, yet they are super comfy compared to regular killer heels! The elasticated side panels and rear pull not only accentuate this design but are also practical for an easy fit. Team these black platform ankle boots with skinny jeans and a chunky knit cardigan for instant winter style otherwise pop on a skater dress, add some edgy studded accessories and a faux cropped leather for a great super cool night time look with a rock chic vibe about it! Step into our pretty lazer cut, peep toe lace up boots with a block heel. Heel Height 4.5 inches 100% TEXTILE. Wipe Clean.